Just two hours south of Lisbon, you’ll find Portimao’s golden sand and turquoise seas that have lured centuries of mariners. Greeks, Phoenicians and Carthaginians were early traders to this port city that flourished under the Moors. The natural harbor has been home to pirates, fisherman, smugglers and tourists. Located on the southern coast of Portugal, Portimao is a city with a rich heritage, natural beauty and cosmopolitan flare that makes an excellent day trip from the capital of Lisbon. Even though Portimao is only 2 hours from Lisbon, you might want to head out early from your Lisbon apartments to be able to take in a full day of exploring. Not a early riser, or would like to take a more leisurely trip to Portimao, plan on spending the night. Portimao’s climate makes it a popular venue for water sports enthusiasts. 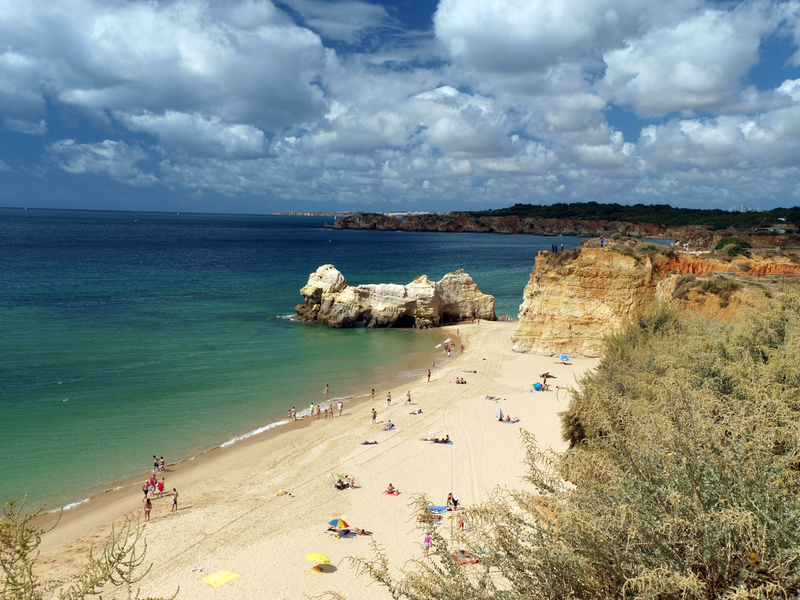 Here you can spend the day on some of the best beaches in Portugal. You can swim, windsurf, scuba dive or watch modern day gladiators compete in off-shore powerboat races. As a main center for sport fisherman, Portimao’s charter boats offer the chance to catch swordfish, marlin, shark and other big game fish. The mix of coves, caves, cliffs, climate and Atlantic Ocean waters makes Portimao an excellent choice for those who want to spend a day on the water. For those looking to experience more of Portugal’s history and culture, one of Portimao’s old canning factories has been transformed into the Municipal Museum. Here, you can see regular exhibits that display the art, history and culture of Portugal and the Algarve region. The aesthetically-pleasing footbridge from Faro is considered one of the most secure bridges built in the 19th century. Visit the city’s 14th century church or travel to nearby Abicada to view a Roman archaeological site dating from the 1st century. You’ll see the ruins of an ancient villa and the beautiful rooms decorated with colorful mosaics, geometric patterns and other stylized designs. At nearby Alcalar, you can see well-preserved Neolithic and Chalcolithic burial grounds. The grave designs range from large stone monument chambers to burial vaults crowned with domes framed by side rooms. For those looking to spend a day shopping ‘til they drop, there’s an eclectic mix of boutiques and vendors with locally-crafted pottery, jewelry and embroidered linens. After you dust off the sand and pack your treasures, dine in one of the city’s famous fresh fish restaurants such as the As Aves Restaurant or the NoSoLoAqua. Those on the go can just enjoy a quick meal of grilled sardines, the region’s local specialty, from a street vendor. You can spend a day relaxing on the beach enjoying the natural beauty of the Arade River. Take the time to walk the pine-covered hills and view the luxurious wildflowers, alluring cultivated fields and panoramic vistas of the city below. You can spend the day playing a round of golf or taking a boat ride to watch the dolphins. Portimao’s local charm, exciting water sports and year-round good weather are just sure to make the 175 mile trip from your apartments in Lisbon worthwhile.